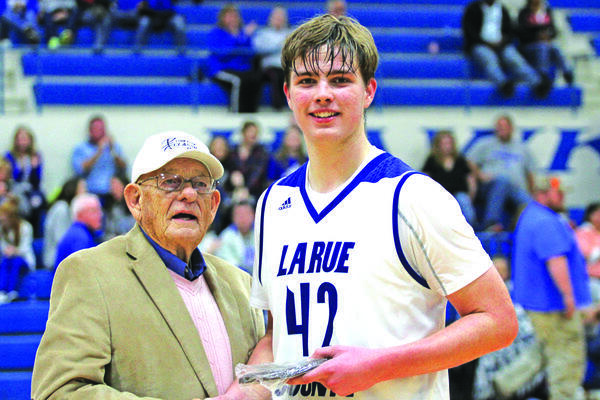 The LaRue County Hawks varsity basketball team won their first game of the season beating East Jessamine Jaguars 65-53 in the Corky Cox Classic on Saturday, December 2. Noah Davis is pictured shooting a three pointer. He was hot from the three point line during the game against East Jessamine as he hit two three pointers in the first quarter to put the Hawks ahead 14-13 at the end of the quarter. 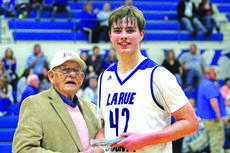 Corky Cox is pictured presenting the Corky Cox MVP trophy for boys basketball to Mark Goode. The Hawks got off to a slow start falling behind by 6 points, but a couple of three pointers by Noah Davis helped the Hawks take a 14-13 lead after the first quarter. Mark Goode put up 11 points in the second quarter as the Hawks extended the lead out to 33-26 at halftime. The Hawks were ahead 50-38 late in the third quarter, but the Jaguars went on a 7-0 run to end the quarter and cut the lead to 5 points. The Hawks had a strong fourth quarter to win by 12. The Hawks were led in scoring by Mark Goode with 23 points, Noah Davis was next with 12, Anthony Adkins had 10, Daillis Cox made 8, Branco Balingate got 5, Shane King had 3, Warner Bryan made 2 and Jeremiah Belton got 2. Head Coach Paul Childress said he thought their first game performance was typical as they came out nervous. “We came out a little keyed up and nervous early on. We got lost on defense early on and gave up some wide-open looks. I have to give East Jessamine credit. They were well schooled and we knew they could shoot the lights out of it. I thought our guys did a great job of settling down in the first half. We began taking the ball inside for some easy buckets and Noah Davis got us going from the perimeter with a couple of threes,” Childress said. “Once we settled down, our defense got better and we forced them into some tougher shots. 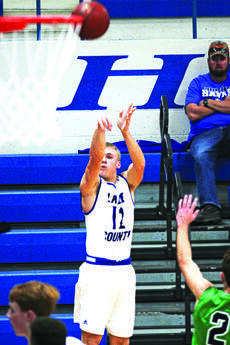 The Hawks played at home on Tuesday against North Hardin. The results of that game will be featured in the December 13 edition of The LaRue County Herald News. Their next game is at home this Friday against the Hart County Raiders at 8 p.m.
Childress said the Raiders will give them a tougher matchup than they did last season when the Hawks beat them 76-39.